Because we are building a house from nothing, basically, the number of choices we were forced to make was sometimes overwhelming. If we had bought a house already built, we would have simply looked at what was there, decided what we didn’t like, and then replace it all. If the house was being built according to a builder’s plan we would have seen what was available and haggled over what we did want and what we didn’t. In a sense, A-1 was close to this model, but the main reason we chose them is because there were many more options involved, and not just in terms of design. But our salesman, N, did try to push certain items on us, presumably because he and and A-1 would get a cut of anything they sold. We’ve already talked about the visit to House Tec, the housing supply and service company that A-1 deals with, and how because of our budget we were limited to certain fixtures and facilities we didn’t really care for. Fortunately, we held our ground on the bathroom sink (no plastic vanity, which is A-1’s default), but were not as forthright with the bathtub and the kitchen cabinets. We ended up getting a unit bath, which we don’t like, but that probably couldn’t be helped because the custom made baths we checked out were very expensive, and we’re not really bath people, anyway. The cabinets may have been a mistake, though. When we went to House Tec to pick them out, because of our budget we were shown only the cheapest line, and we took it without really asking. Had we spent a little more we could have gotten better stuff–i.e., drawer cabinets instead of the conventional door types. But for other fixtures we decided to tell A-1 that we would go about it ourselves, and not just because we thought it would be cheaper. For instance, the initial estimate included all lighting fixtures, which A-1 would purchase through its agent and then pass on to us. They told us outright that they could buy these fixtures cheaper and we believed them, but we have some lighting fixtures already that work fine and look OK, so it seemed like a redundant expense. In any case, we don’t like the kind of garishly bright overhead lights that Japanese people favor, so while we did have rosettes installed in the ceiling, most will be equipped with fans, not lights. A-1 gave us a catalogue of one of their lighting suppliers and we looked through that and then went on line and purchased the fixtures that we needed ourselves. They were sent to our apartment so we will just bring them over to the new house to have them installed when the electrical work is done. Another, more important matter we decided to handle ourselves was the heating system. Since the house would be all-electric, the most economical means of heating would be air conditioning units for each room, but we don’t like using air conditioners for either heating or cooling, a preference, especially with regard to the latter, that always invites derision. Both of us grew up in homes that were not air conditioned, though we lived in places that got quite hot in the summer. One reason we chose this particular piece of land is that it is surrounded by trees and though the difference is probably only a degree or two the idea of “natural” air conditioning appealed to us. The artificial kind tends to make us ill, especially if you’re moving in and out of cold rooms all the time. As for heating, we don’t really like the typical air circulation method, which involves heating air and then moving it around a room by means of a fan. We prefer radiant heating, which is basically heating surfaces through infrared radiation. We thought about central heating, which is rare and expensive in Japanese houses, and also about floor heating. Our current apartment has floor heating, but only in one section of the living room. That room is relatively warm, but it’s very expensive since the heat is supplied by water circulated through pipes in the floor and heated in the gas boiler. We’d been told by others who use floor heating that they couldn’t live without it, but it’s difficult to judge based on our situation because the living room has a very high ceiling so it’s not the more efficient room to heat. In any case, we have to use electric space heaters in the other rooms, so our heating bills are very high. What we wanted was heating that was even throughout the house at all times. After all, the upstairs is, not counting the bath, just one big room. The downstairs is two rooms separated by a wide hallway. Since we work at home, it makes sense to have a unified heating system rather than a component system, but when we checked into floor heating for the entire house we ran into a few snags. For one thing we would have to start right away since a floor heating system, using either water heated in the Eco Cute electric boiler we were having installed or electric elements, has to be incorporated into the basic design of the house. Another, more serious problem is that you need special floors for floor heating systems, usually veneer flooring, which we don’t like. There are floor heating systems made for natural wood floors, but A-1 doesn’t deal with them for some reason, which means we would have had to contract out for a specialist for just the floors, and that would have involved all sorts of inconveniences for A-1, and us. So we decided to go with storage heaters, which are big boxes filled with ceramic bricks that are placed in a central location in the house. They absorb energy at night when the cost of electricity is low and then release it during the rest of the day as radiant heat. A-1 recommended this method because House Tec sells a system built by a German company. Based on the size of our house they recommented two storage heaters, one for each floor, which would have come to more than ¥500,000. We decided to look around ourselves and found a dealer in Narita that sells storage heaters made by a Japanese company, Aldi, which is headquartered on the Japan Sea coast, where the winters can get quite bitter. 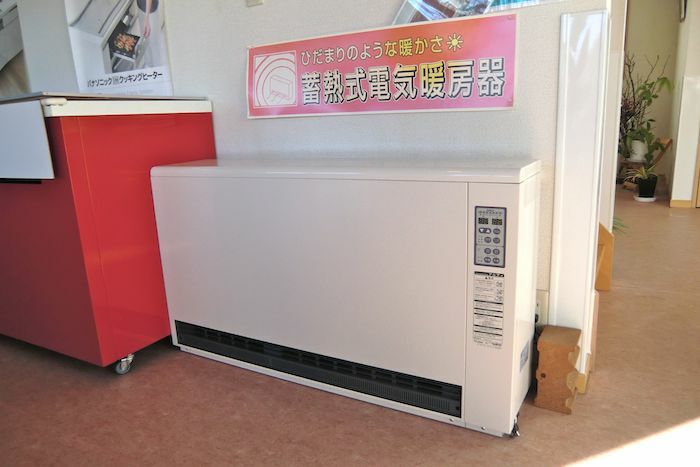 Storage heaters are popular in Hokkaido because air conditioners are not effective there. Air conditioners use heat pumps and heat pumps don’t work well below certain temperatures. Apparently, Aldi thought heat storage was also a good method for residences on the Japan Sea coast. We visited the showroom in Narita and talked to the woman who ran it. She had one space heater set up in the main room of the office and it was intimidatingly big, about two meters long and 30 cm deep. She looked at the plans for our house and recommended a 50-kilowatt unit for the downstairs and 60-kilowatt for the upstairs. The heaters come in various sizes in stages of 10 kilowatts, the biggest being 70-kilowatts. She explained the physics behind the process and gave us an estimate that was almost ¥100,000 less than House Tec’s. Later we contacted A-1 and after a few days they came back with a comparative price—not as cheap as the Aldi but House Tec tried to make the case that the German model was better in that Europeans had been making these kinds of heaters for a long time. But we liked the idea of buying local, nd the warranty for the Aldi was five years. Even after that the company would provide regular service, virtually for life. So we eventually decided to go with Aldi, but that meant coordinating between A-1 and the sales agent. The main difficulty with space heaters is the weight. Each unit is more than 300 kilograms, which means the floor under it would have to be reinforced. Also, special electrical outlets would need to be installed. Our problem, then, was selecting the best place for them. Since our house is small and these heaters are huge, we spent a few days going over the drawings. Actually, the only place we could put the downstairs heater was below the stairway, which was wasted space anyway, but the saleswoman told us that we might end up losing heat since it would just rise from heater up the stairs and into the second floor, where we decided to put the other heater against the wall to the right of the stairs, because that was the only place where it would not be in the way of something else. We compromised. Instead of a 50-kilowatt unit downstairs and a 60 upstairs, we opted for two 60s so that the downstairs would be heated more evenly. This would be made possible by installing ceiling fans to aid in air circulation, something we had already planned anyway. Obviously, A-1 wasn’t pleased that we went outside to purchase a heating system since House Tec would lose a big sale, but they got over it pretty quickly. In any case, we bought the water heating system from House Tec, and the city subsidy for the septic tank had come through, so House Tec would be getting that sale as well. Could you mention what kind of insulation the house has? Ceilings and walls are insulated with 100mm fiberglass (or “glass wool,” in Japanese) units, while the floors are under-enforced with polystyrene foam blocks. The roof is galvanium underlined with asphalt. All windows are double-paned but the frames are aluminum. The walls themselves are natural wood panels that are 12mm thick and the floors, also natural wood, are 15mm thick. One of A-1’s sales points is that the wood itself offers natural insulation and is much more effective than sheetrock. Or so they say. A storage heater isn’t radiant heat (in the infrared sense). It’s not really any different than split ductless, blowing (or expelling) warm air, except you’re going to have less control over where the warmth is. Did the dealer also ‘fess up that everyone in Hokkaido who has these things also has two or three kerosine heaters in the house? You seem stubbornly insistent on being a contrarian and doing things different than the Japanese (who are all conspiring to rip you off). I’m beginning to think that this blog is an extremely elaborate, drawn-out troll. Harsh! It’s the price of convenience. You let someone decide and organize everything and because of the ‘arrangements’ they have with suppliers, everything is more expensive. This is probably not just the case in Japan but quite common as many don’t shop around and just put faith in someone else because it’s the ‘safe’ option. Well, in the case of HVAC, the standard arrangement is there isn’t any HVAC. Builders leave it up to you to take care of after you move in. The only consideration during building is the wiring of electrical outlets high on the wall in each room. Typically you’d buy split-ductless air conditioners at the electrical shop, and you have plenty of price options based on the shop, the brand, the model, and the model year. It’s a pretty mature technology, so there’s no point in going for anything expensive. Buying last year’s model of an off brand at a discount shop in a basic model (no “sensors” or “self cleaning”) is very inexpensive. The shops can arrange the installation, or you can hire an independent to do it if you want a prettier job done. I think what our host here really would want if he could afford it is a “Passivhaus”: super-insulated, airtight, passive heating and lighting. These are tricky to build, since they need to be closely tuned to the local climate. Just an idea–maybe some bullet points or titles to make it a bit easier to read!! reading the summary, that doesn’t really get into the reality on the ground, that buildings in Japan get pretty “ratty” as the decades pass. I for one think it’s the rainy + extremely humid climate, combined with rather poor materials, construction, and maintenance. Japan’s population did grow 40% between 1950 and 1980, so that prompted a lot of new building. Plus Japan’s per-capita real GDP rose substantially in the 20th century, rising from the third world in the Taisho era to the world’s #2 economy. Actually, it does get into the reality. It argues that because the close-to-null resale value of the Japanese homes, no one takes care of them. It argues also that the Japanese wooden homes are the best quality products worldwide. I just listened to it. I am not, have not been and will not be into the market for a home here (Japan), I just enjoy your blog and the hard work you are putting into the whole construction process but from pure anecdotal evidence I will tend to agree with both above-mentioned points. It also argues that because all the economic growth you are alluding to and the destruction of the Japanese cities after the WWII, Japan built hastily too many homes during the economic boom years of a lower quality. But listen to it, if you have time and desire. I actually have a friend working into the construction industry – one of the three major companies – he is in the int’l sales and he always tells me creepy stories of how they are laughed at when his company offers their pricing abroad for construction of residential buildings. The company seems to be perplexed how those quality homes are non-marketable abroad. Construction employment is indeed 2X that of the US, but AFAIK construction is Japan’s make-work program much on the scale the US’s ~$800B/yr DOD spending is (Japan’s DOD spends ~$50B/yr). Lots of good points, the “vicious cycle” that since removal is expected in 20-30 years nobody builds for quality or maintains the place, and increased earthquake safety being used as an inducement to build new instead of remodel. One other inducement towards new construction is Japan’s 2% interest rates. This greatly reduces the lifetime cost penalty of construction, and I do think the mold/mildew problem is significant in Japan, something not mentioned in the podcast. I feel that if your company provides you with some monthly rent allowance, or there is a company dorm, or you could get into the public housing, there should not be no worry of building your own place. It does not make sense for me, especially in Tokyo. If the population is rising, the price of the land should be more valuable in the future but in this hollowing out decreasing in might economy, I do not believe it is the case. I see more younger Japanese came to a satori of sorts that you could live in not a new home as well. They said on the podcast that the vacancy is 20%. I had heard before that from a real estate agency and in my experience – the rent for a place we used to live went 10% then 15% lower after nobody wanted to rent it for the price we paid before moving out. We also have lived in very old building with supposed trouble with the mildew. Well, it had some issues but I believe if the place had been renovated just a bit it would not have been almost like new home to live in. Keep the great work. Very informative on your side, as well. actually, it is. Higher home prices are literally bankrupting all advanced economies, outside France and Germany. Norway, Sweden, Denmark, Netherlands — all have very troublesome mortgage leverage ratios. The PIIGS — housing appreciation / crash blew up their economies. USA, Japan, same thing. Australia and Canada also have their own housing sector issues bubbling up. Economics has an immense blind spot about real estate; housing is a zero-sum game. It is a durable good, but should not be “capital wealth” with expected yields, since it is an essential good. This is not to disagree that rebuilding unnecessarily is extremely uneconomic. But Japan land values are so out of whack — our host’s rather marginal land in BFE Chiba is valued at $1M/acre — clearly Japan’s disposable housing is not to blame. I am not sure about this. What probably you are arguing is that presumed need to live in your own home in those countries led all new families in the post WWII to yearn after and pursue their own home which has perpetuated this housing bubble cycles and ever increasing prices. What Koo argues, from my point of view, is that if you have higher quality homes and keep them renovated, you would expect them to last longer, thus reducing the 30 year cycle to let’s 100 or 150 year cycle of building new home. Or maybe I am misreading both of you. Where I am coming from, in Europe, the older houses, if have been renovated, tend to command quite higher prices to newer construction and had I stayed in my home town quite possibly I would have lived with my extended family in quite huge house. What was not discussed in the program, from my limited knowledge, is the inheritance tax. I am pretty sure where I live here in Tokyo that the decedents of all older folks that passed away in last 5-7 years have sold the land to pay the necessary taxes (and keep something for themselves, of course). I cut off my concluding thought above . . . my point about Japan’s rising real GDP meant that the homes that survived WW2 were no longer suitable to Japan’s new place of wealth. The housing stock was actually pretty cruddy, even (especially!) the postwar stuff that was thrown up to re-house everyone. Anyway, my general thesis is that the cost of housing (renting or buying) will rise to whatever it takes to outbid the next guy who also wants the tenancy. Since buildable land is limited in supply, especially so for buildable land convenient to civilization, this bidding will go to the limits of affordability, and beyond, since historically price inflation and land appreciation has bailed out the brave. This is orthogonal to how well the houses are constructed and maintained, since the sale value is mostly in the locational value of the land [for city properties; in our host’s case they found the cheapest land they could so the ratio is more 1:2 towards the fixed improvement]. 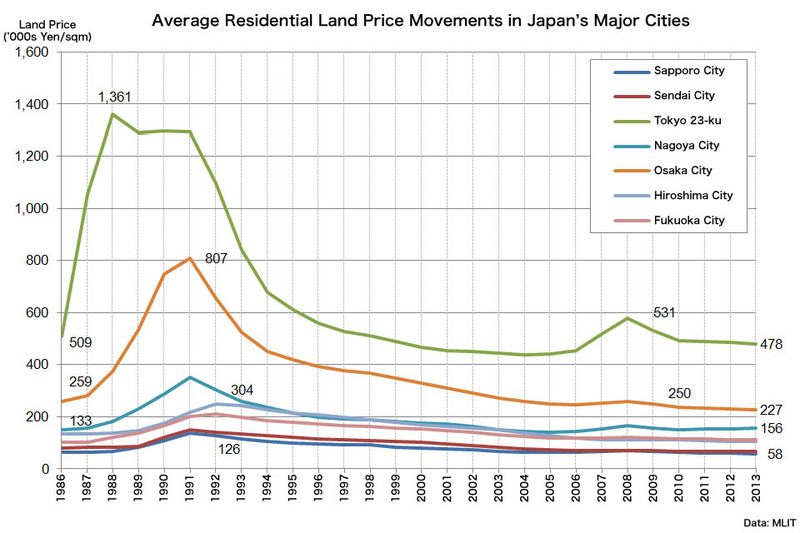 The problem with Japan that Koo is actually describing is that land values hit the wall in 1990, having clearly zoomed well past the outer limits of affordability (just like what happened in 2005-2007 in the US). What modern economics elides in this story is that these stratospheric market valuations are not actual wealth, but just a higher cost of living the next generation has to pay! Japan’s declining demographics are going to put a lot of economic understandings to the test like this. Going by online listings, valuations are still insane in Japan, 2% Flat 35 rates or no. Japan’s CPI is totally flat since 1995. Why should home prices have risen anyway? Falling home valuations are a net good, not a bad thing! This is something the nordic states might have to learn the hard way, again. I think that the numbers on your heaters are out by a decimal point. By “60kW”, I guess you mean your heaters are 6.0 kW. That will be the size of the heater inside heating the bricks when electricity is cheap. Note also the main reason electricity is cheap overnight is that nuclear power stations have the same output 24 hours a day and cannot follow demand for electricity. To continue offering big discounts overnight for heating and eco cute water heaters, power companies need to turn the nuke plants back on. For us on Chubu Denryoku, overnight power has gone up by about a third since 3/11. The price increase in daytime power has been less than 10%. Thanks for the heads up. According to the press release, the Aldy brand has been sold or transferred to another company. In any event, all warranties are still good and after service and parts are guaranteed for at least ten years after purchase.